Children at a small rural school in northern Botswana have started the new year with an extra spring in their step. The children at Mabele Primary School, on the edge of Chobe National Park, are wearing brand new sturdy black shoes following the generosity of tourists staying at the nearby Ngoma Safari Lodge. 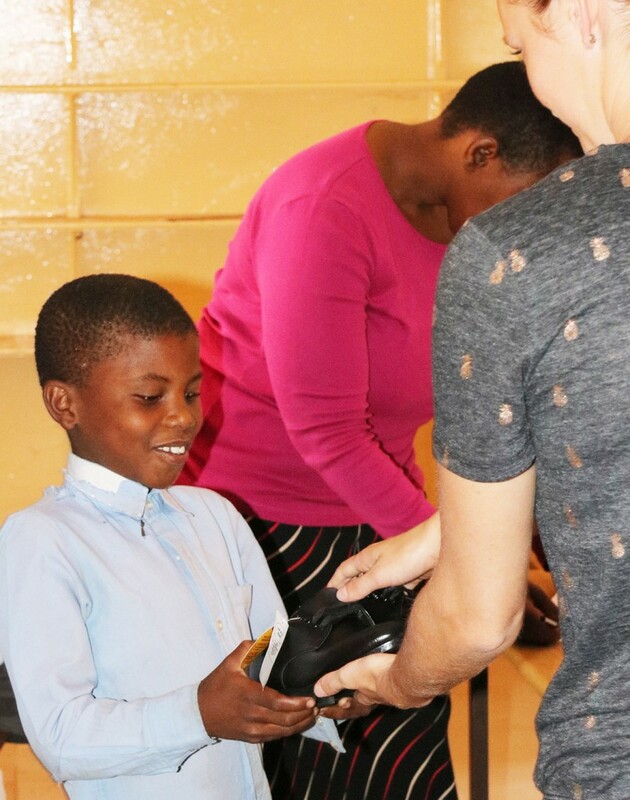 Ngoma Safari Lodge manager Frances van Pletzen said it all began with one guest, who visited the school, as part of the lodge’s community outreach projects, and noticed some of the children were in desperate need of school shoes. “The American woman, who had been holidaying with her family, decided to leave $50, so that we could go and buy some shoes for the children,” Ms van Pletzen said. “I then went to Mabele Primary School and asked the student councillor which children were in need of new school shoes, and she gave me a list of the students, with their shoe sizes,” she said. “Some of these children had no school shoes, but wore old and broken casual shoes instead, and others just had really worn out broken school shoes. “I decided to raise more money so that we can help more children, so as more guests came and asked how they could contribute, I told them about the school shoe fund, to which they were happy to donate. By the time the shoe fund reached US$520, there was enough money to buy the 24 pairs of shoes that were needed, and even a little bit left over. Ms van Pletzen bought the school shoes, and they were delivered to the overjoyed students at Mabele Primary School just before it closed for the Christmas holidays, enabling them to start their new school year in 2017 with brand new shoes. The leftover money was used to buy sports equipment for the school, such as balls for soccer, netball and volleyball, as well as a volleyball net and a hand pump for the balls. “We are very grateful to all the guests who contributed to make this possible,” Ms van Pletzen said. Ngoma Safari Lodge, part of hospitality group Africa Albida Tourism’s portfolio of properties, is a secluded boutique luxury lodge in Chobe Forest Reserve, with panoramic views over the wildlife-rich Chobe floodplain and river.